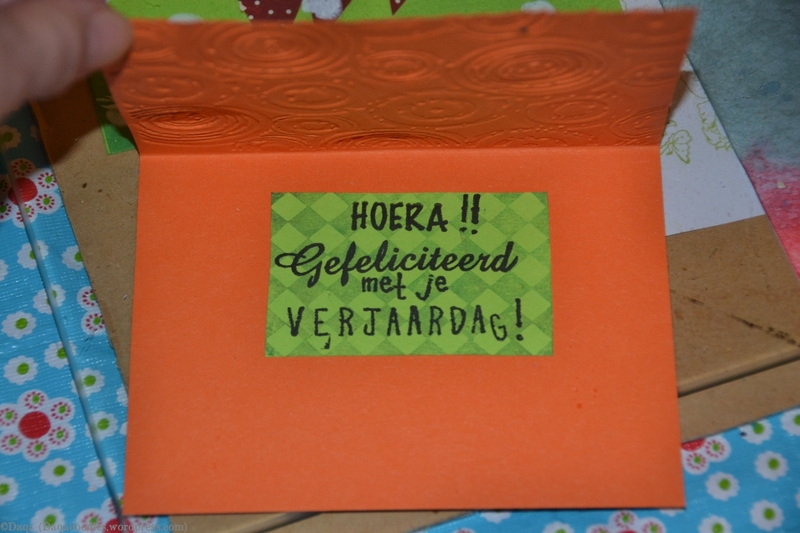 Het schattige zeepaardje staat voor plezier. Deze zul je uiteraard op straat niet tegenkomen, maar wel in dromen. Het zeepaardje gebruikt de kracht van het dansen, heeft het vermogen zich staande te houden tijdens emotionele momenten en geeft regelmatig nakomelingen. Je kunt dit dus ook met vruchtbaarheid linken. Het zeepaardje staat symbool voor vaderschap en zorg, vrijheid en sierlijkheid. Ook staat het zeepaardje symbool voor een andere kijk op het leven; nieuwe emoties. The adorable seahorse means fun. You won’t see this animal on street, but you can see encounter it in dreams. The seahorse uses the power of dancing, and has the ability to be strong during emotional moments and gives offspring regularly, so there is a link with fertility. The seahorse symbolises fatherhood and care, freedom and elegancy. 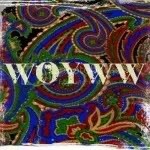 It also is a symbol for a different look on life; new emotions. Seahorse – Insight, freedom, magical powers, healingpowers, a balance between male gentile power and female strong power, clearvoyance. 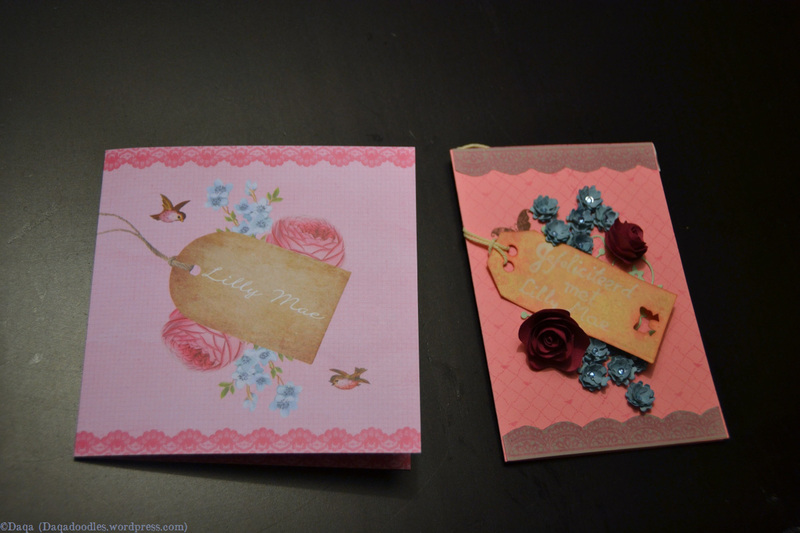 (I missed a letter with the embossing, added it before taking the other two pictures). 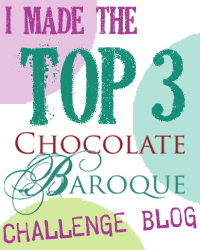 This is my first entry for the chocolate baroque colour challenge #6. I didn’t just want to add a “happy birthday” line, since I’m not sure if it’s a happy birthday (her daughter had a severe accident a while ago). She became 40. A year ago she ofcourse had imagined her 40th birthday very different. She uses the seahorse herself, made wetfelted seahorses as they have a special meaning to her now. This is a video of an exposition of some of her work in October. I just noticed this post in my drafts folder. 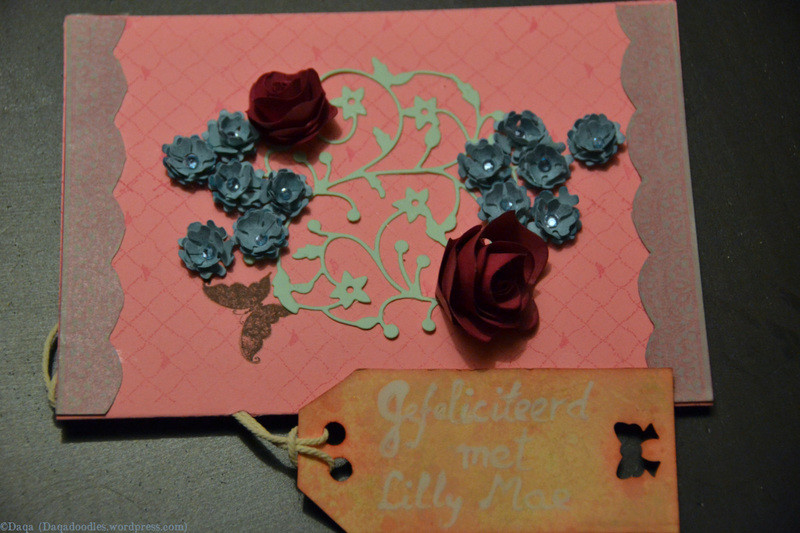 My brother in law’s birthday was in June, so it’s another “old” card, and even an old post too! 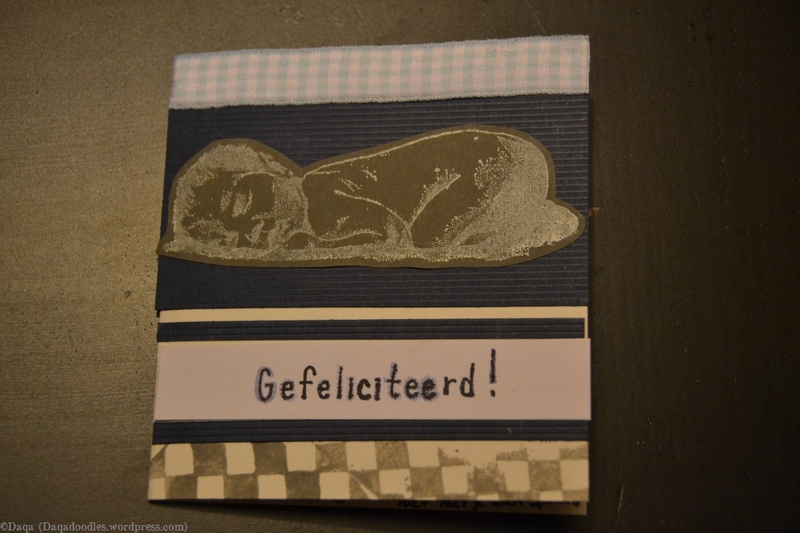 This was a birthdaycard for my brother in law. 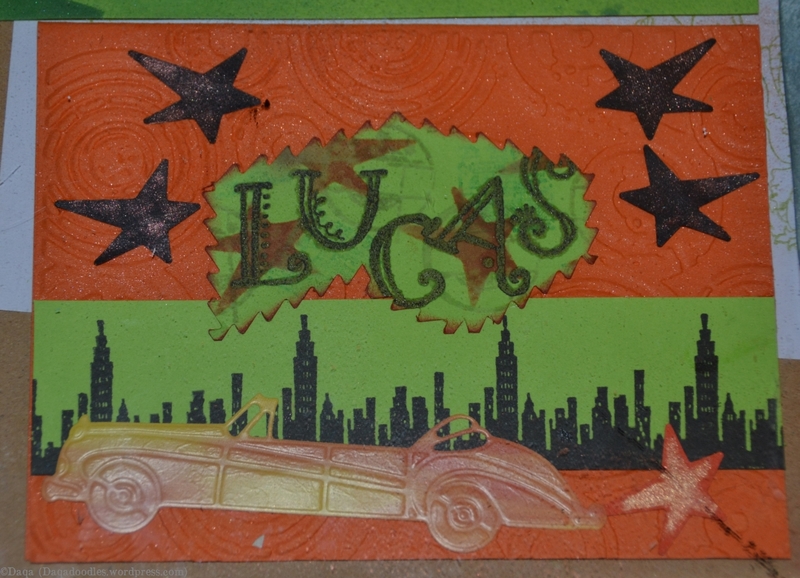 I didn’t want to make the typical men card: brown, dark colours, cars or steampunk. His wife is Kim from Viltalakim, so he’s used to lots of flowers and colours in his house, so I made him this. 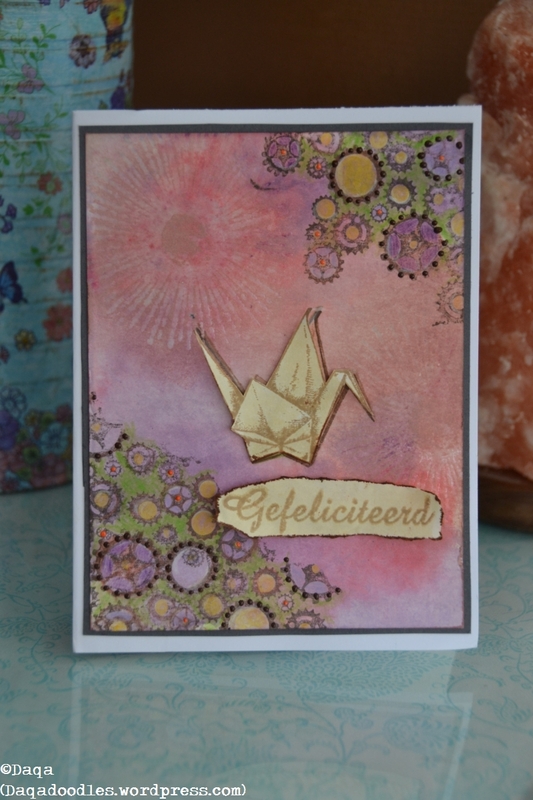 The background was made with distress inks. The cogs are roughly coloured wiht pencil, and I added a feew accents with paper pens. Most finished, with two car shaped candles on top. I finally went to bed around 03:00 (am), very tired. Next day my partner took care of the kids while I continued with the cake, started around 11:00ish I think. We had asked people to come around 15:00, as that is usually the time my son wakes up from his afternoon nap. So about 4 hrs to go. What do you mean, bad planning? I made the bananabuttercream, checking internet/the recipe every 5 minutes. I know, it doesn’t change in the meantime, but my pc is not in the kitchen and I wanted to make sure all went according to the recipe. IAnyway, I happily started making the banana filling. While mixing the bananas, I discovered I had no gelatine sheets. I somehow though I had those still, that I had once bought them but never used them. As I couldn’t leave the mashed bananas like this if i didn’t want them brown, I added the juice of half a lemon now allreadiy instead of later, according to the recipe. Then hop on my bike and race to the store. I picked up a few more decorating items and rushed back home. Time for lunch, but I wanted this done so it could sit in the fridge and stiffen up. Half an hour later, at lunch. I’m going over the cake in my head, and checking the computer for the next step. The window with the recipe of the banana was still open, and I looked at it briefly, and then again: woops! I had forgotten to add the cream to the banana/gelatine mix! So I went back to the kitchen to mix the cream, and add some of it through the bananamixture. It was allready stiffening, but hey, just mix firmly. I didn’t add all the cream like the recipy suggested, I added about a fourth of it, as I had plenty of filling anyway and I preferred more banana over cream. Filling went back in the fridge and I went back to lunch. Then I covered the cake in bananabuttercream, and added the filling. 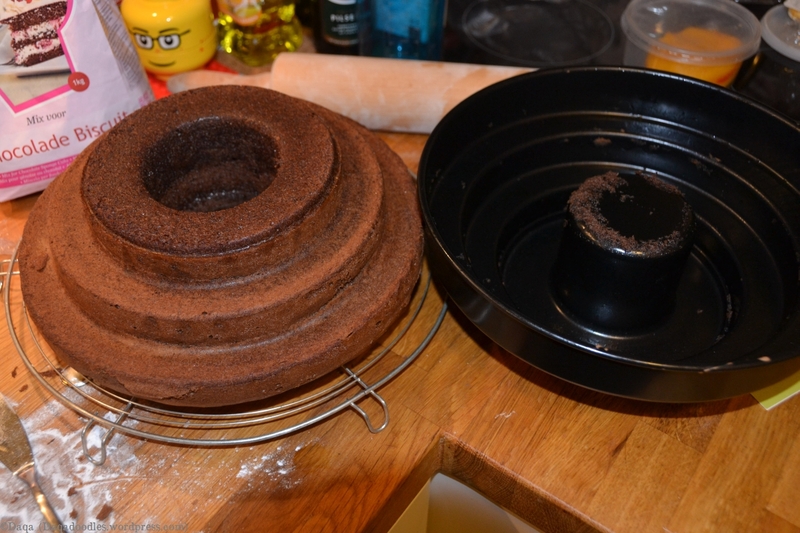 I had cut off the top (now bottom) of the cake to make it flat, but it was quite a bit as it was domeshaped. 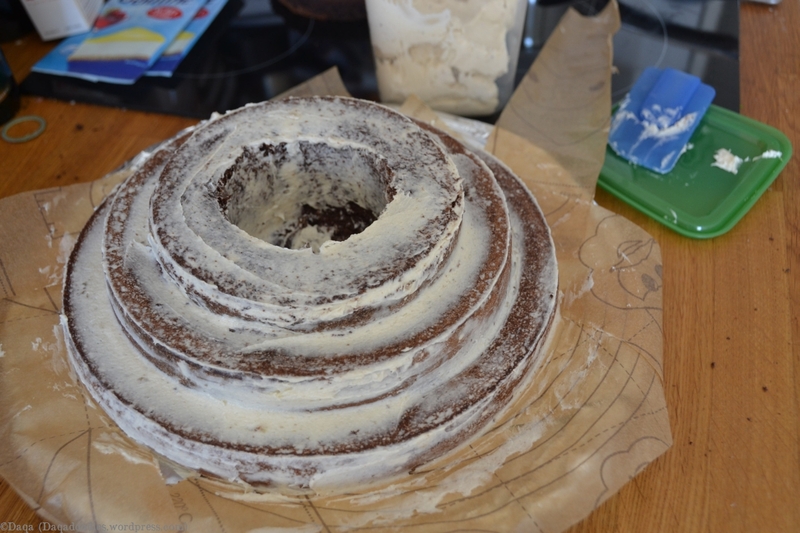 I cut a circle out of it, the size of the smallest circle to make my cake a bit higher. So I added that, buttered it, and then it was time for the next step. Note: To get a smooth cake it is adviced to put the cake in the fridge after buttering it. Let the butter stiffen a bit, and then it’s easier to make it smooth. I didn’t have time for that, and I thought: No matter how hideous it looks, my son will love it :). I walk to (and from) the kitchen (checking recipe and such) and see the mail down below. (We have an appartment with the frontdoor being down the stairs). I see a big envelop. My partner thinks it’s commercials, but I think I recognize the logo. It’s the print I ordered! Yay! Great timing! Not so great is the state it is in. I had asked the sender to write on the envelop that it shouldn’t be folded as our mailman tends to do that. We still have an old small mailbox in the front door. We want to replace it, but it’s a lot of work and we have never found the time to do so. 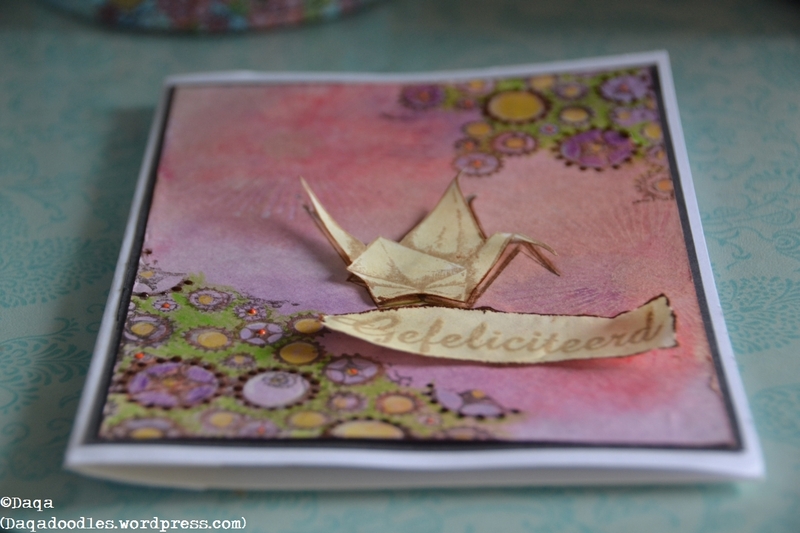 On the envelop is a huge stamp that says: Fragile! Do not fold! We were at home so the mailman could have rang the door. But no. Mr or Mrs mailman apparantly can’t read big red stamps and folded it anyway.I’m a bit anxious when I open it: will the print still be ok? Luckily it was! So yay, just in time and no damage! 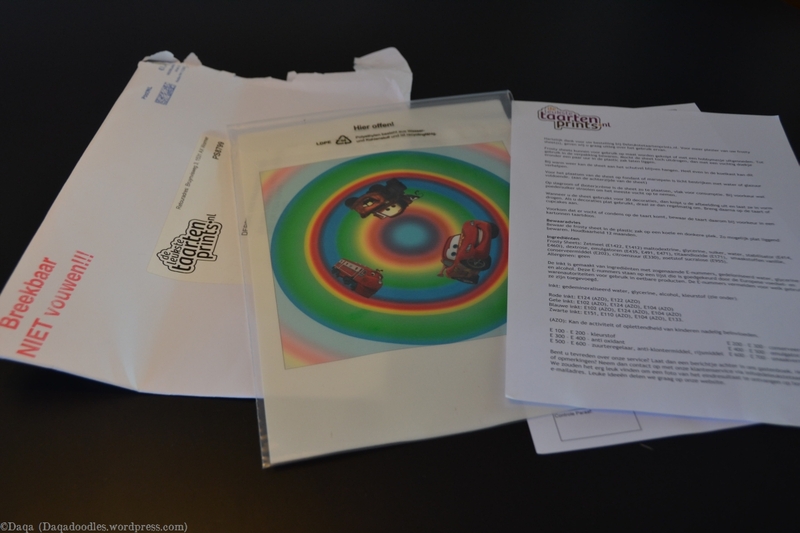 The print and bent enveloppe. See the red stamp? And put it on the cake. Oooh a nice piece of fondant that is, it looks great like this! So thin, fragile… I don’t like thick layers of fondant, I don’t like it if it’s very sweet in one bite. Time to press it on the cake! This looks so smooth, light, supple. Can’t believe it’s (mainly) sugar! Push it down. Make it smooth. Hmm. How do you do that? Can you just make it melt together by wetting it a bit, like with dough for croissants or by swiping across it like playdough? Hmm. That doesn’t seem to work. Oh well, times ticking, I’ll cover it up. Note: I still haven’t searched for a way to make it “melt” back together without kneading it again, but I do know that you can prevent wrinkles by smoothing it down differently. Start at the top, go outwards from the center. Then, start at one place to smooth it down. 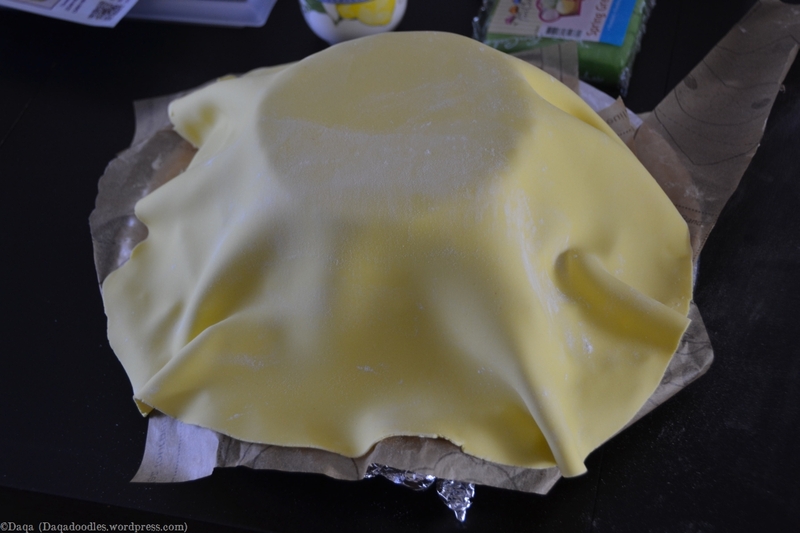 Lift the fondant next to that place up a bit again and smooth it down again so you’ll have no wrinkles. And so forth. 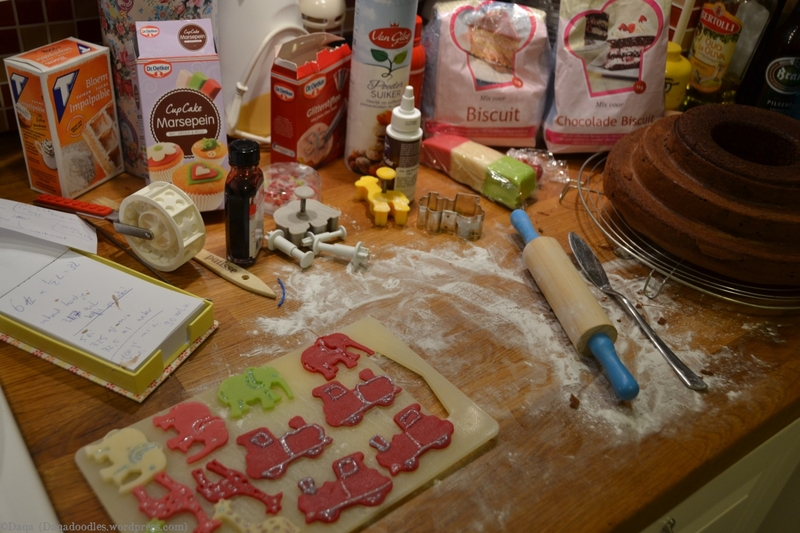 I don’t know what will happen if you reach the end of the circle, if you have lots of fondant left (that will form a huge wrinkle). I’ll need to read up on that a bit more. Eeeh what wrinkels? Nooooo I really didn’t try to smooth it out with water! Next, cutting out the print. I didn’t exactly cut very .. eh.. exact. I’m great in thinking: “I’ll cover that up later”. So I thought that again this time. I had first thought to cut the circle a bit bigger and then see if I could fold the print down, but the type of material I had is like edible paper and can’t be folded. Hmm geez, I feel a bit stupid now, writing this… a huge DUH moment now… only now the realization, that if the mailman isn’t allowed to fold it or else it will be damaged, I can’t fold it either without damaging it! 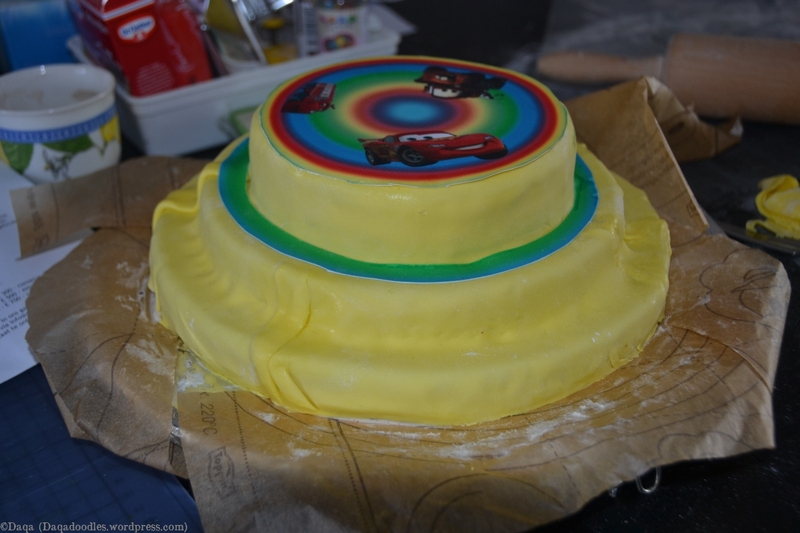 Anyway, seeying as that wouldn’t work I cut out a smaller circle, close to the yellow so it would blend into the cake a bit more. I got an idea for the leftover circle: Use it on the circle below it! The decoration on top, and the left over circle I reused a layer lower. Time was pressing. I had some cream left from the bananafilling, albeit a bit over-whipped. But it was usefull for making the confetti stick. Somewhat. It didn’t stick that well actually. Or did I use buttercream for it? I can’t remember. 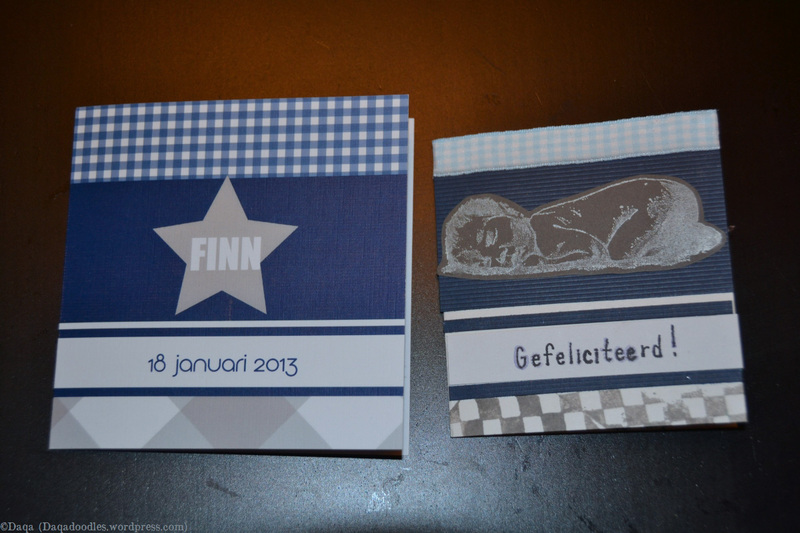 After the confetti layer (the bottom one) I added the punched out animals. The cake didn’t look finished then. The layer of green stood out, and I still had to use the fruit. So a ring of whipped cream on the bottom layer and middle layer to put the fruit on. And some whipped cream on the top to cover the edge of the print. IT was about 14:45, and I started on the stars which I had punched earlier. It was fun punching those out. Around 14:50 I was almost done, the doorbell rang, the first visitors had arrived. Quickly adding the last stars. The doorbell rang again, about 3 minutes later. The second visitors had arrived. I started cleaning up a bit. 2 minutes later, the last visitors arrived. I was almost done cleaning up. 15:00, I could say I was done and had cleaned up. Now, if that isn’t a tight schedule! Exactly on time! We sat the visitors down, offered tea and coffee, and as my son usually wakes up around this time I decided to wait with the other cakes (kersenvlaai and appelkruimelvlaai) untill he was awake. But he slept. And slept. Around 15:45 I opened the door of his room, hoping the sounds of visitors would wake him up. 5 minutes later I go in and stroke him on the back, noticing he is slightly waking up. I leave again, wanting him to wake up relaxed and not startled. 5 minutes later he’s awake, and I go get him. He needs to wake up a bit more, is a bit overwhelmed by the people in the living room. Finally he was completely awake and used to the people, and we could get the cake. He loved it, kept poking in it at first and making me lick off the cream. I quickly took off the candlecars though, as I suspected he would try to eat them. 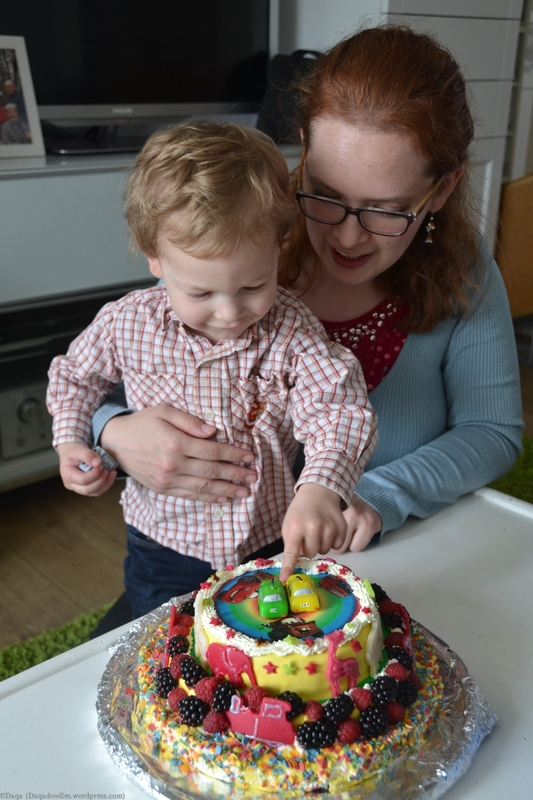 Can’t blame him, how can you tell the difference between edible and non edible on such a colourfull cake? 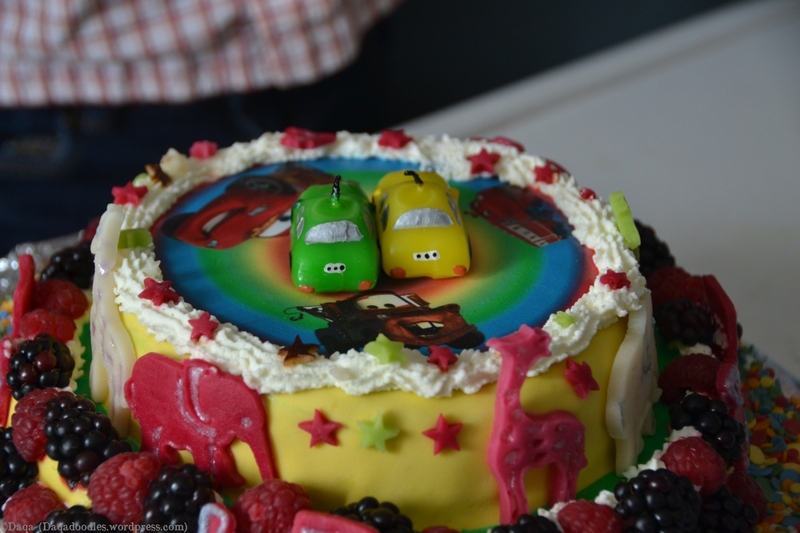 More finished, with two candles of cars. The cake was delicious, albeit a bit small. Only had a small bit left for the visitors for sunday. I didn’t really think about the amount of people that needed to eat from it, I just wanted to make a cake for my son. I wished I had two of these, as I would have loved to eat lots of it! Sweet but not too sweet, with fruit in and on it. I even liked the bananabuttercream! And my son? He loved it. The elephands, giraffes, trains, Mater (Takel)(“Takel”), Lightning Mc Queen (Bliksem McQueen) (“auto!”) and Wilson from Chuggington “Trein”! He ate most of his cake, (his dad the rest), and the next day I ate most of his cake. 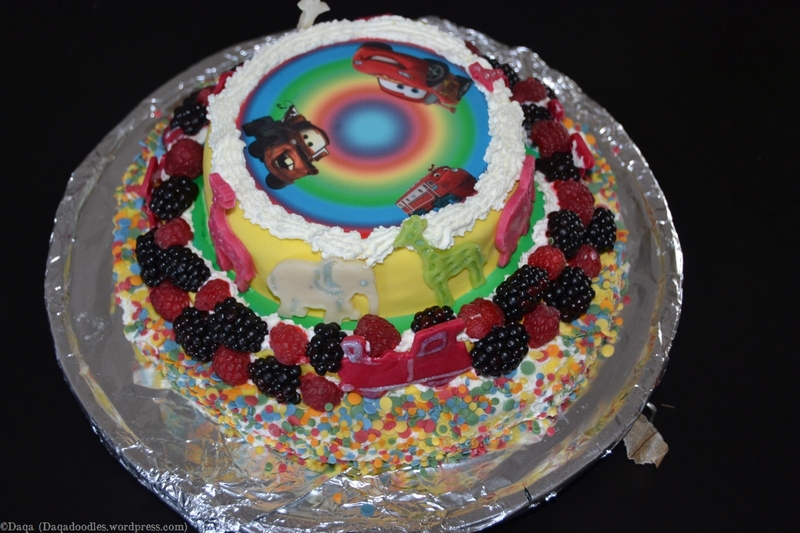 So there it is, my cake, not perfect for professionals, but perfect for my son! I’ve been absent again for a while. On 2nd christmasday I got a bad fever, I really couldn’t do anything but stay in bed. Not the way you imagine spending Christmas. In the following 6 weeks I had the flu twice more, felt drained of energy and had several colds. I blame it on the weather: spring is needed! Sun is needed! That’ll give my health a boost. I also blame it on a flu virus which lingers for 6 to 8 weeks, I probably had that variant. I also blame it on low resistance, due to a loooong winter, and lack of sleep. Slowly I was getting more energy again, those 2 days of spring in ..when was it, february? really helped me “survive”. It was needed. Now, I feel spring is near, but it’s not yet here. My health is better now, my sleep is better. My daughter is sleeping on the same room as my son since about 3 weeks ago, (since 18th of March). After a weekend at my parents place, where we slept in one room (partner, kids and me), he asked the followin monday, when he went to bed, if Freya could sleep in his room too. Now I make it look like he literally asked this, but he’s not even 2 yet, he can’t make sentences. He can point to the upper bed of the double bed, and say: “Aya?” “Aya!”. So we asked, should we get Freya? He nods. We put her in the upper bed, and he is happy and dives into his own bed. From that night on she sleeps there every night, and sinve a few nights ago she sleeps through the night till morning. She used to wake up after 03:00 for a while, but that is over now, despite her cold. Poor girl. Been having a cold on and off since christmas, that hinders her sleep. Last weeks have been busy as well, computer has been barely on at home, but now, while waiting for a cake to cooldown, there is time for an update. Tomorrow we’ll be celebrating my sons 2nd birthday. 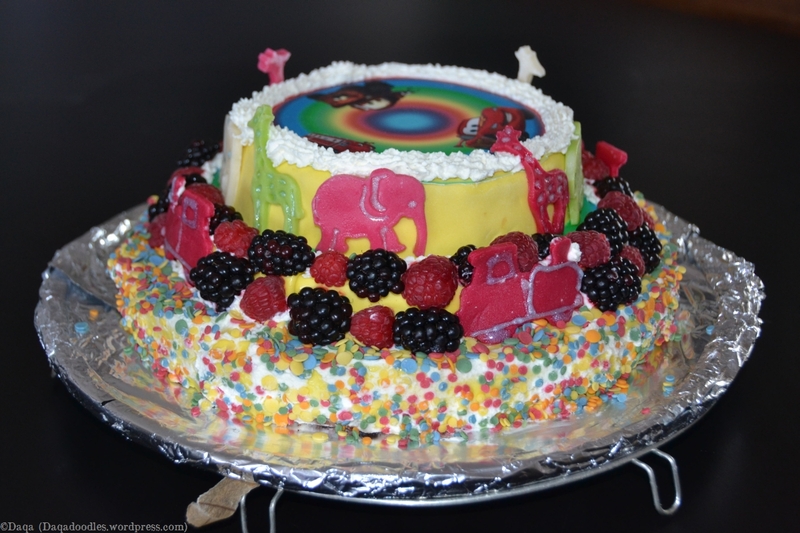 As I didn’t see a childrenscake I liked in the (online) stores, I decided to make one myself. My son doesn’t like whipped cream that much, and most bought childrenscakes are cream cakes (slagroomtaarten). I wanted more fruit. Wednesday morning I also received a message that one of my dearest friend has had a severe burnout. She lives too far away to visit frequently. We’ve been very close, but due to the distance our lives are less intertwined. The bond is still strong, but the details of daily life are not shared on a daily or weekly base anymore. It was hard for me to hear she is ill, as I felt so totally helpless. And guilty that I do not invest enough time in my friendships. I am not a good friend, I am usually not the one who picks up the phone to dial someone. I try to improve, try to send out more mails, send an unexpected card, or even call, but soon I revert to my own day to day life and neglect my social contacts. So, to stop myself from worrying to much while there was nothing I could do, (except write a long e-mail to her partner, and have a card ready for her) I focused again T’s his birthday. I found this webshop & forum and spend a few hours browsing through, finally ordering a print and several baking ingredients and materials. The print is from a slightly different shop, but I should have read the small prints better: They would ship it the same day if ordered before 14:00. So I thought, jay! then it will be here on friday, just in time! But, the mail has a delivery time of up to 3 workdays…. it will probably arrive monday. 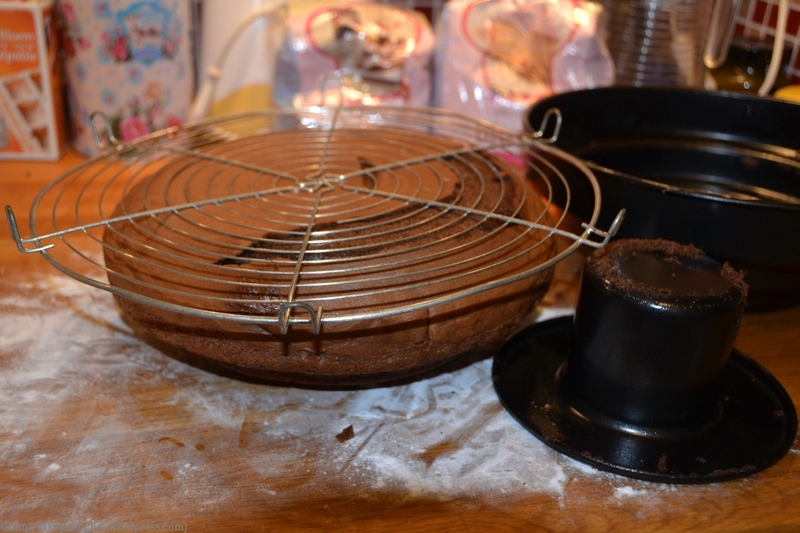 Yesterday evening I made a first cake, a tulband [turban]. During mixing I thought of my friend. Not only due to the bad news, but also because I think I’ve always done that. As I keep remembering how enthousiast she once was about a cake she made with a drill. The mixer was broken, and she and her bf wanted cake. 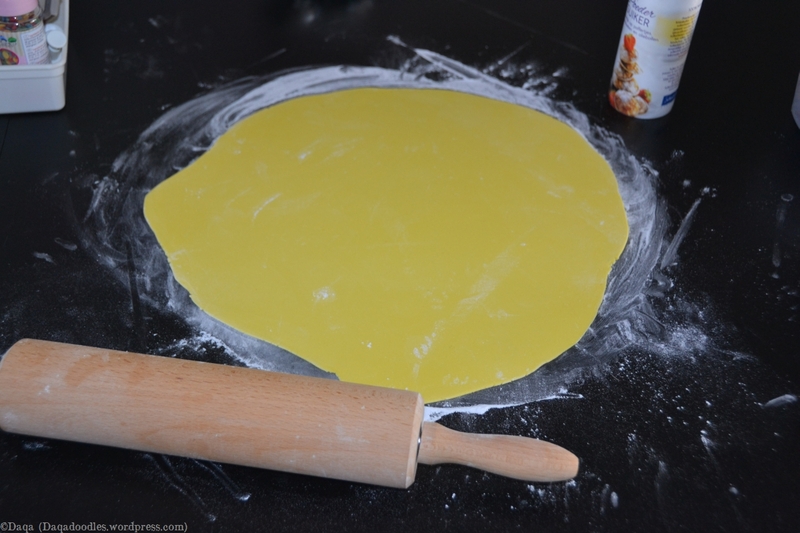 So they carefully put the garde (mixing-utensil) into a drill, and carefully mixed the batter. I remember how delighted whe was about it, how “lyrisch”. The batter was smooth, shining, soft… She almost considered using a drill every time for making batter. The cake was delicious. (Though I can’t remember if I had any of it). Thinking of that always brings a smile to my face! 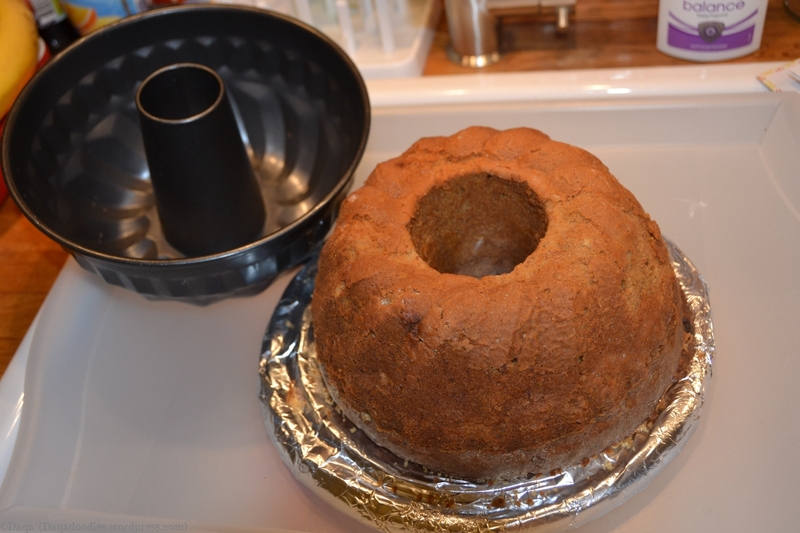 Back to the recipy, banana whimsical bakehouse cake (site is in Dutch). It required brown sugar which I didn’t have enough of, so I used palmsugar instead. I always do that. Meticuti..meticulo…Precisely following instructions up to one point where I start adventuring and adding my own touch. Just like yesterday. I kind of forgot that palmsugar is salty of itself. So I added the required amount of salt according to the original recipe. Although the structure of the cake is excellent and the look is great, the taste is just a little bit too salty. Not very very salty, I didn’t quite notice it the first bite. But after the 2nd or 3rd bite I had enough, not exactly the taste I had in mind. Behold the cake with gula jawa instead of bruine basterdsuiker. Maybe with a less salt it might be tastier. Now I save it for my parents to taste on sunday, to see if they (well if my mom) thinks it could be a good cake with less salt. Palm sugar is a natural sugar and healthier then the normal suger. Oh, in case you’re wondering: I used the gula jawa with the bamboo strip around it, it’s a sort of disk. Took a lot of mixing (and before that some chopping) to get it to be absorbed by tehe batter well enough. I had greased the baking form with a spray and then sprinkled flour in it, as I am used to do. Well putting flour in it is, the spray is new, usually I used butter. (Only today I read that isn’t really necessary). So today I got the baking ingredients and materials, and just now, after my yoga class, started working on the cake. I’ve received a cakeform with christmas and decided to use it. 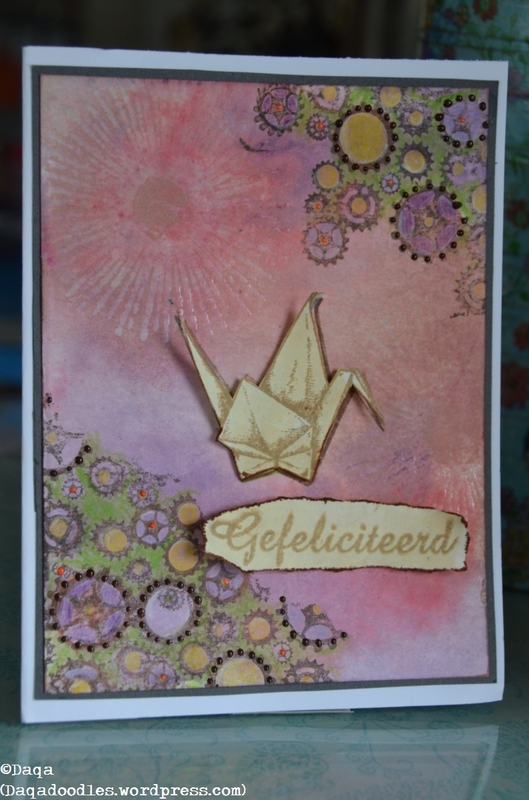 (stapeltaart bakblik / bakvorm van de Xenos of van cookandco.nl). 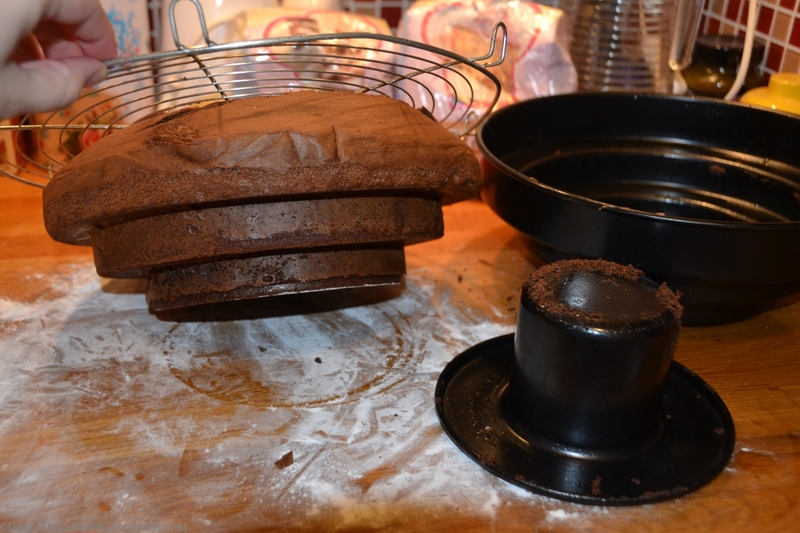 Usually a stacked cake is made by placing circles on top of eachother, not in this way. But I got it as a present so wanted to use it. Carefully I followd instructions for the chocolate biscuit mix. As well as I could. I made some adjustments. 450 gr mix, 5 eggs (which weighed about 290 gr), 105 ml water. Baked it about an hour I think. I had set the alarm on 10 minutes several times, but at 30 minutes it looked like it was baking too fast so turned the heat down. (From 150 on a hot air oven to 145degrees). And 5 minutes later it felt still very not yet done, so I decided to go ahead and have some fun with the punchers and marsepein I had. I kept checking the cake, and decided it was done eventually. How long it had been in the oven? eeeh….several times 10 minutes plus several times a couple of minutes? My guess is about 50 minutes. Mostly at 150 degrees, a bit lower, and then a bit higher. I’m not good at experimenting. 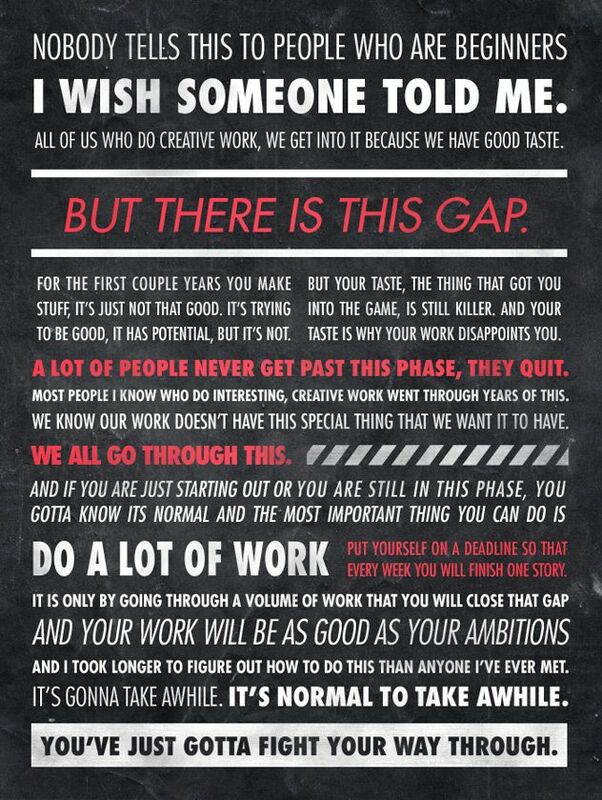 Good experimenters write down what they do so they can reproduce it. I always think I will remember what I’ve done. Fast forward 5 minutes and I’ve forgotten the amounts and time allready. Probably because I know I won’t stick to them next time. I’ll be experimenting again. Mixing the stuff. Hm… doesn’t look like much. Ooooh it’s getting bigger! The eggs are getting fluffier! Look how it shines! ooooh it rises more. Eh. Wait, stop! that doesn’t fit in my mixerbowl anymore, my mixer (on a standard) is about to drown! That is easily fixed, remove the mixer from the standard and do the last bit with the mixer in hand. It looks good. It tastes good. I hated making cakes while I was pregnant, as I wasn’t allowed to taste the batter, (raw eggs) and I love to taste the batter. (Also a reason why I decided baking is not a hobby I should pursue. 1 – I like the batter too much. 2 – I’d be eating probably the largest amount of what I bake, because it is always too much, so we are left with half a cake. What happens to it? It ends up in my partners tummy. And mine. Mostly mine I must admit. So, it should not be a hobby of mine. But making cakes is fun! Anyway. Marsepein. 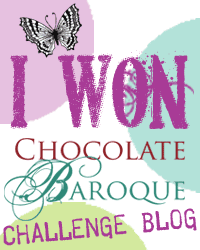 Tobias doesn’t really like it, so for the cover of the cake I had ordered fondant, hopefully he likes that. He isn’t much into sweet stuff (yet). I’ll add lots of fruit to the cake. Punching out the shapes was fun, yet how do I remove the excess castingsugar? Oh well, just make it wet a bit. Hmm. Now my marzipan was a bit wet. How do I dry it? Not in the fridge, it will “sweat” in there, so out on the kitchencounter. Apparantly, you can use casting sugar to make it more dry. But then it will have this dull look of the casting sugar, and as I’ve been creative with (edible) glitter gel on it allready, and thus can’t rub on the marzipan. Oh well, it’s a childrens cake. He’ll love it no matter how it looks, as long as we present it like it’s very important and special. cakes with filling between them. I’ll go and make a picture of the cake as it is now. I’ll be right back. Oooh I can almost make a mushroom cake out of it. A Shi-take mushroom cake. Shi-take because it’s a very flat mushroom cake, and the shi-takes always look so flat and thin. As it’s late, I can’t be bothered to clean my kitchen properly before taking the pictures, or to crop the photo’s. It’s the counter of a mom of 2 young kids who was a bit nervous about baking and the party tomorrow. I bet, secretly, a lot of counters look like this, only people make it look like a moviecounter or a kitchenshowroomcountertop right before they take pictures :P. Anyway, pictures! Hmm smooth talking won’t work, I have to push this mushroom out of the rack. Doesn’t look too bad, does it? A bit dark though. And I am still kind of worried the inside isn’t completely done though. Oh, you can see a small portion of my home made play-dough in the background, I’ve been keeping it in the fridge but I think that isn’t necessary. 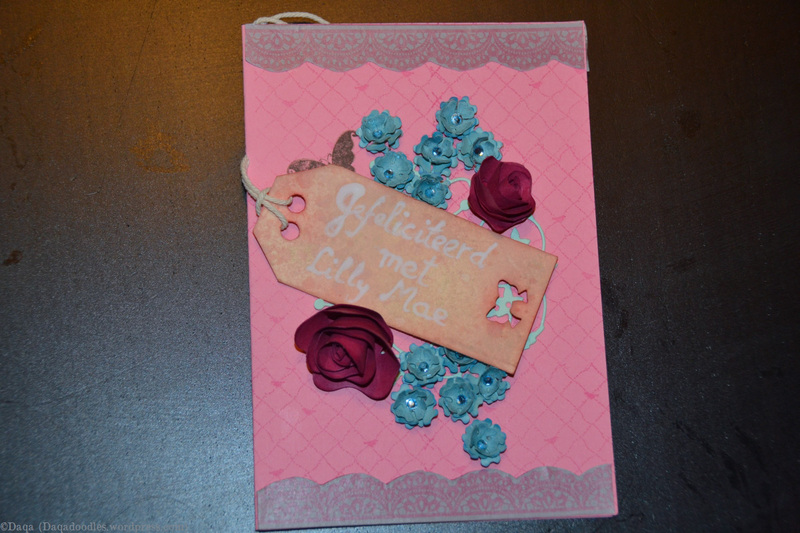 Now a small overview of several of my purchases at de leukste taarten shop.nl (The site is available in Dutch and English) and several items I allready had or which I had purchased in a regular supermarket as yesterday I got nervous about the delivery not making it today. 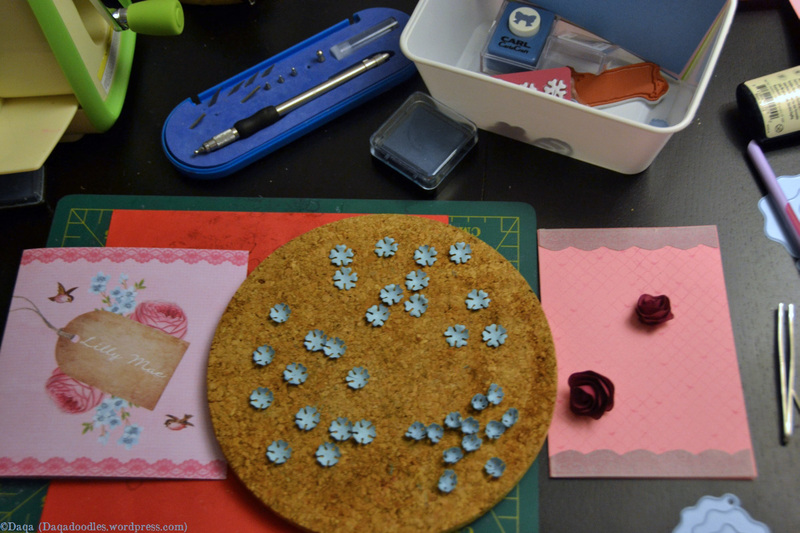 This is my workspace before I collected the items onto a tray. Elephant in dutch is olifant, and my son says “owa”. I forgot how he pronounces giraffe. Train is trein in dutch (“ein” according to my son). I didn’t use the lego cookie cutter yet, I have tried using it before on cookie dough but it doesn’t work very well. Maybe it will work better on marzipan or fondant? Next to it is red foofcoloring from the toko (asian store). My lesson learned: don’t pour it out of the bottle onto your food. Put it in teacup, or even better, use a toothpick to get some color out and swipe the toothpick on the food. I wanted a drop, got a whole teaspoon. The original colour of the marzipan was white, green, pink, and I wanted it to be more red instead of pink. So I colored some pink marzipan, but because I used too much coloring I mixed in the remaining white and green as well. (I didn’t use all marzipan, the leftover you see in the back isn’t used). I had allready punched out an elephant an giraffe in pink. There’s foodink on the tray as well, in the brown bottle. You can use it on foodstamps to, what do you guess, stamp food! I have lots of stamps, but no foodstamps. Wondering if it will work on (well cleaned) regular stamps or foam stamps as well? hmmm. Too much to try out, too little time! The little punches in the front (3 white things) are starpunches. You can see several punched out stars in the little box. It’s so fun to use! I had to restrain myself to not keep punching. 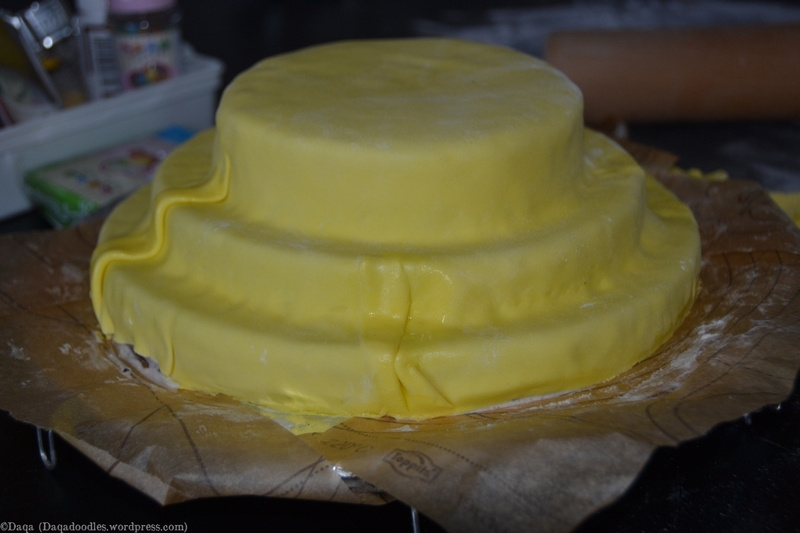 After all, I have to put the fondant on the cake first, and then think of a layout. 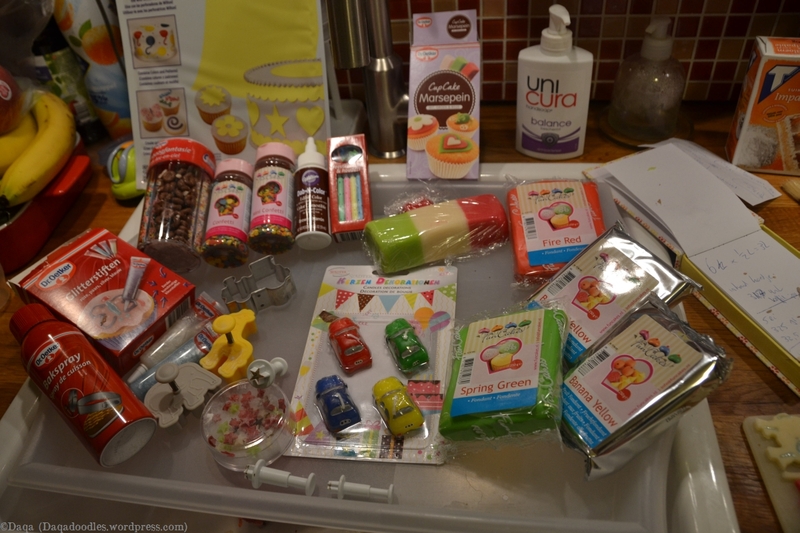 I bet most people do that before they start baking, but I only start with a general idea, a set of colours and a set of possible items to use. 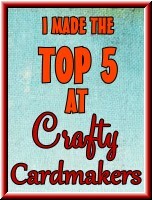 I do it like that with other crafts as well, and usually it turns out ok. I like to be surprised by myself, wondering what I’ll cook up next ;). The cars in the middle are candles. He loves cars. 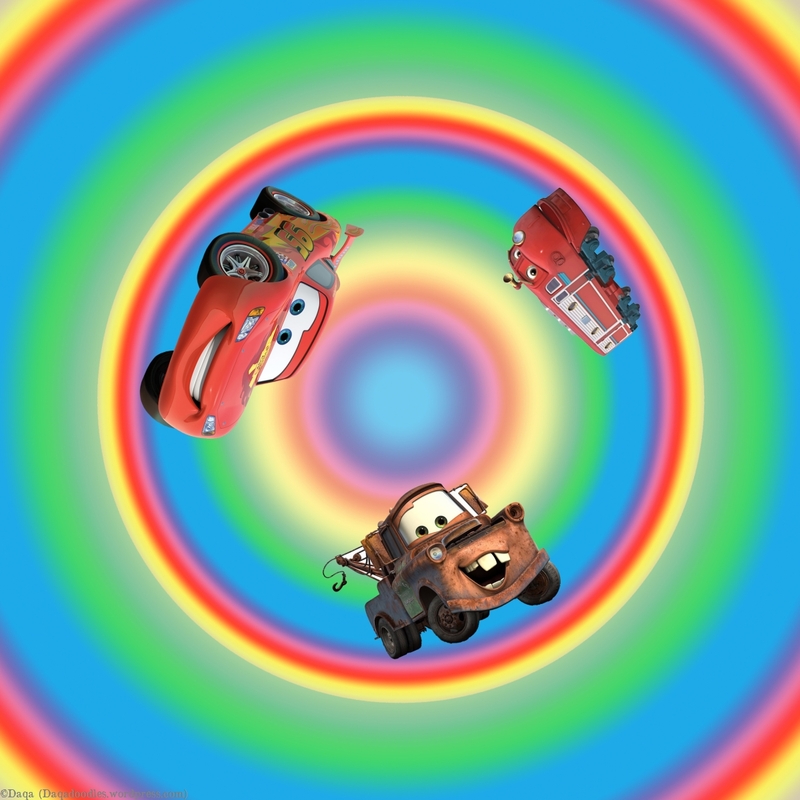 (Not only the movie Cars, but all other cars as well.) And trains. And Bambi. (Namni, or Nani). And excavators. Firetrucks. 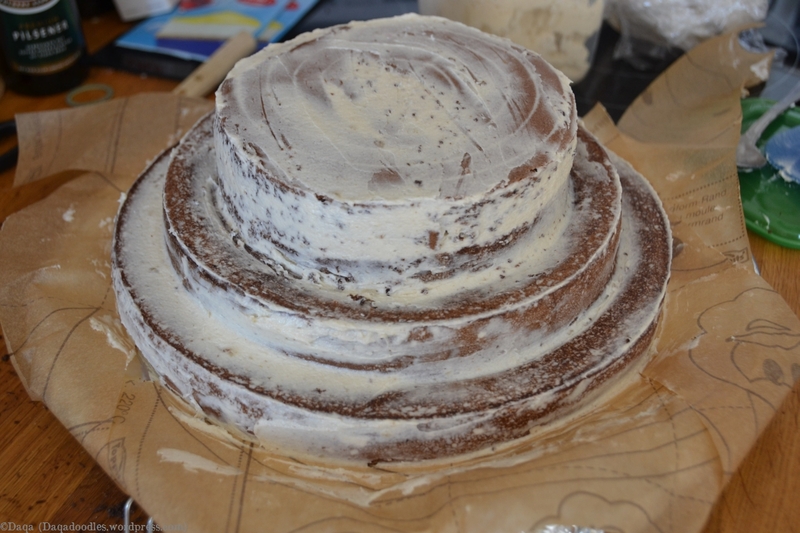 Round caketopping, somewhere about the green lines is the diameter of the top cake. It will be hard to position this print, but I intended to cover it with some cream around the edges so it wouldn’t be very obvious if it would be off centre. Oops. I just realized, (at 1:45 in the night), that we haven’t put up the eh, forgot the english name, slingers in dutch… you know, the flags/garlands/banners. Bunting! That’s it… now off to do that and then hop into bed!